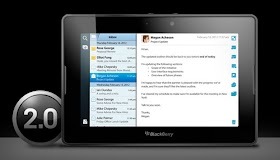 BlackBerry Playbook OS 2.0 was officially released by RIM today after being delayed several times. BlackBerry Playbook OS 2.0 will bring a wide range of improvements and various addition of new features that were previously absent in the BlackBerry Playbook such as integration of native email and the ability to run Android applications in the Playbook. If only OS 2.0 features were presented when PlayBook launched, the story might be different as it is now; where Playbook stock piled in warehouses because of fierce competition with Android and iPad tablet. Native Email Client : This feature is the same as in BlackBerry smartphone where all messages either email, facebook, twitter, and linkedin stored in unified inbox. Social integration with calender and contact : One more feature that should have been present since the BlackBerry Playbook launched, because these features are already in BlackBerry smartphone since OS6. Updated BlackBerry Bridge: With BlackBerry PlayBook OS 2.0, it’s easier and quicker than ever to take documents, web pages, emails and photos that appear on your BlackBerry smartphone and display them on your BlackBerry PlayBook for an optimized viewing and editing experience. BlackBerry Bridge app also provides a remote control feature that allows a BlackBerry smartphone to be used as a wireless keyboard and mouse for a BlackBerry PlayBook. Improved mobile productivity: Print To Go, Docs To Go, BlackBerry Balance, updated virtual keyboard with auto correction and predictive text (SwiftKey) and Enhanced web browsing capabilities. New apps and content: Thousands of PlayBook applications including Android Apps are available in BlackBerry App World. BlackBerry Video Store: where you can buy or rent film or tv show. BlackBerry PlayBook owners who want to update Playbook to OS 2.0 can open Settings > Software Updates > Check for Update. You will see a messege to "Download BlackBerry Playbook 2.0", follow the onscreen instructions to finish updating your PlayBook.